Garden furniture can be a big investment, and an investment that you want to take care of. With the days getting shorter and the temperatures dropping, you might want to start thinking about what's going to happen to those pieces once winter comes. So today we're taking a look at everything you need to know about winterizing your garden furniture, so come spring you'll still have a great looking garden! When it comes to winterizing garden furniture, there are four basic choices that you've got. You can leave furniture outside as it is, you can treat certain pieces before leaving them, you can cover some things before leaving them, or you can bring that furniture inside. But just how do you go about making the right decision for each piece? A lot is going to depend on the kind of material we're talking about, as well as where pieces are placed in your garden. Metal pieces like tables, benches and chairs can be a tough call, but generally they're safe to be left outside all year round. Light, aluminium furniture has almost certainly been pre treated with a special powder to protect it against rust, so should be fairly safe. Simply wash it down with a clean cloth. If you think winter is going to be particularly harsh, you can apply a coat of car wax (yes, really!) to that aluminium to further protect it. Wrought iron, those heavier pieces, need a little more pre-winter care. They are quite susceptible to rust, so use a wire brush to get rid of any rust that is already visible. If that wrought iron is painted (which it generally is), apply a coat of specialised paint (specialised both for wrought iron and for outside use). Finally, cover the piece with a tarp or other protector before leaving it outside (bungee cords will secure a tarp quite firmly). Any pieces that are made of plastic or fabric need to be brought inside and can't simply be left. Plastic might be low maintenance and easy to take care of, but it's also very brittle, and cold winter temperatures will make it crack. Wash pieces down with the hose, dry them off with some rags, then store them somewhere out of the way. Cushions, umbrellas, and anything else that contains fabric do need to be taken care of at the end of the season, or you'll risk mould and black spots. Wash fabrics down with soapy water (avoid using bleach), vacuum things like large umbrellas to get rid of dust and pollen, and then store them safely away out of the damp and away from the cold. Many of us choose garden furniture in natural materials, from bin stores to benches, woods and rattan make for nice additions to a garden. But despite being natural, these materials do also need some pre winter care. Natural rattan is very delicate and should always be brought inside and kept in a cool, dark, place. In fact, rattan should be brought in after every use if at all possible to avoid it getting damp. 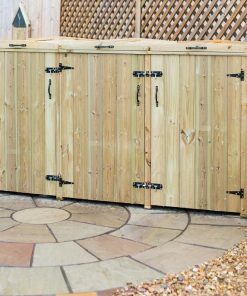 Artificial wicker and rattan on the other hand should be perfectly safe outdoors in all weathers, so you don't need to worry about that at all. As for woods, most woods will fare pretty well outside even when temperatures drop below zero. Hard woods like teak are particularly durable. However, whatever kind of wood you have, it's recommended to apply a protective stain before the first frost. Check your manufacturer's instructions on this, but as a general rule “shiny” wood requires oil and “dull” wood requires a stain. This will help protect against fungi, damp, and other kinds of damage. You do need to keep in mind where pieces are placed when preparing for winter. Whilst that covered wrought iron bench might be fine outside it's not a great idea to leave it in an area that's likely to fill up with snow or rain, for example. If possible, move any furniture that you're leaving outside to a sheltered spot. 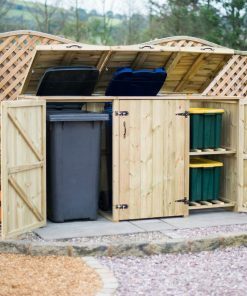 Items like bin stores, that are designed to be left out all year round, shouldn't need moving. As long as stores have cantered lids to prevent build up of snow or ice, they should be fine. It's worth running a hose over any concrete surfaces to see where water is likely to collect, and to make sure that a wooden piece isn't likely to be standing in puddles for long periods of time. There are two other things that you may not have considered when you're thinking about winterizing your garden furniture. The first is that barbecue. Your grill should be properly cleaned before winter, and smaller grills can be brought inside and stored in a garage. Larger barbecues should be covered with a tarp, making sure to secure the plastic firmly around the base or legs of the grill. The second thing is the patio itself. If you have a patio or other concrete base (maybe a base for a bin store or similar), it's a good idea to give the surface a proper wash before winter sets in. Blast concrete with a spray attachment for your hose, or rent a power washer to do the job really well (and fast!). This should make the surface easier to clean off when ice and snow come. Garden furniture doesn't come cheap, so if you've made a hefty investment getting your garden to look good, it's more than worth taking the time to ensure that your furniture is going to survive the winter. Follow these tips and you'll be back out on your lounger in the spring, rather than out shopping for new garden furniture!